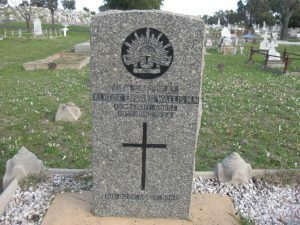 Grave Location – Anglican A-122. Date/Place of Birth- November, 1888 / Bunbury, W. A.
Enlistment Date/Place – 14 January, 1915, Blackboy Hill, W.A. Address– Carey Street, Bunbury, W.A..
Next of Kin– Father- Matthew Edward Wallis of Carey Street, Bunbury, W.A. Date of Discharge- 3 October, 1919. 15/07/1915– Taken on Strength- 10th Light Horse Anzac B Squadron. 7/08/1915– Part of the famous charge at the Nek, Gallipoli. 29-30/08/1915- Involved in the heroic attack on Hill 60, Gallipoli. 1/12/1915- Suffered Lumbago- evacuated to Mudros. 24/12/1915- Embarked on “ Caledonia “ to Alexandria. 1916- Throughout the year, the 10th Light Horse defended Egypt against the Turks who were advancing on the Suez Canal. They drove the Turks across the Deserts of Sinai. 1917- Part of the Desert Column that advanced into Palestine, helping to capture Jerusalem. 18/07/1917- Admitted with Debility to Bemisela/Maraket. 25/07/1917- Discharged to duty ex. Light Horse Field Ambulance. 7/09/1917- Transferred to Rest Camp at Port Said. 29/11/1917- Awarded Military Medal for “ Acts of Gallantry and devotion to Duty in the field “. London Gazette, Third Supplement No. 30606 Dated 29 March 1918, and Commonwealth of Australia Gazette No. 120 dated 7 August 1918. 31/03/1918- Promoted to Lance Corporal. May 1918- Participated in the Es Salt Raid. 1/07/1918- Transferred to Rest Camp at Port Said. 16-22/07/1918- Sick to Hospital Cairo ( Boils to Arm and hand. August 1918- Took part in raids that routed the Ottoman Army in the Jordan Valley. September 1918- Part of first regiment to win battle for Damascus. 7/10/1918- Proceede on 14 days sick leave in Abbassia. 29/10/1918- To Cairo on leave from Moascar. 18/12/1918- Rejoined 10th Light Horse Regiment. 1919- Took part in the putting down of the uprising in Egypt.